For hundreds of years, landscape architecture focused on highly structured, formal spaces and was confined to the highest echelons, like palaces and museums. 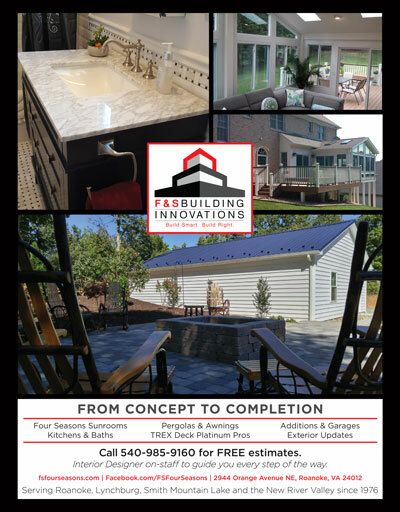 But as homeowners throughout the world have come to learn, just about any good idea can be modified to fit scale and taste. And as attentions shift outside, landscapers are looking to Mother Nature for inspiration. Rocks have become a prominent design element, in part because they come in so many shapes, sizes and textures. The uses for incorporating rocks in outdoor landscaping can vary as much as the rocks themselves—from functional to purely aesthetic or a combination thereof, and designs can range from the placement of a single boulder to the creation of a fully functioning outdoor kitchen. Two things to consider are how adding rocks will look in the existing surroundings, and to make sure that all of those involved in the project have the same general idea. 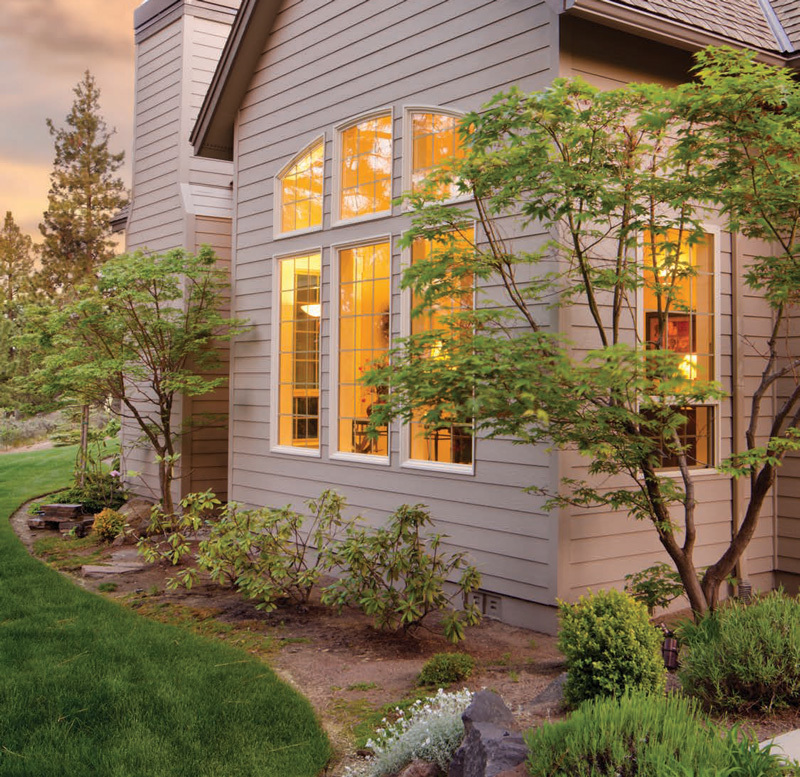 Chris Templeton, president of CLC Inc., a local design and build landscape firm, says sometimes a husband and wife might have different ideas about what they want or need; other times they agree on a design they’ve seen and would like to replicate, but for various reasons, it might not work for their property. Sometimes a budget isn’t realistic. “We don’t really want the budget to be the driving factor,” says Templeton. “But it is a factor, so we’ll try to figure out a way to make it work. Maybe it’s doing a design and then implementing it in phases, or figuring out the most important area and concentrating on that.” Once those decisions are made, landscape designers can get into the details, the intricacies, of what makes each project unique. Really, landscapers say, anywhere a home may once have had brick, concrete or even wood, stone is an option. 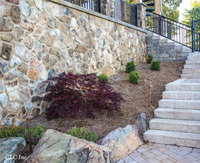 Landscapers say they have seen many trends come and go over the years; what is essential when discussing stone is to understand that once it’s installed, it’s staying. When compared to more traditional landscape options (grass, ground cover, bushes, and even mulch), using rock in landscaping conserves water, uses less energy, requires fewer chemicals to maintain, and reduces waste. These factors may resonate even more with lakeside homeowners, as chemical run off (specifically nitrates) from fertilizers have been linked to problems in water ecosystems. This could be true of a singular, small project, like using gravel instead of mulch in a small bed, and for larger projects, like using gravel to create an environmentally friendly driveway. Unlike conventional driveway materials that use a variety of chemicals which expand and contract as temperatures change (called outgassing), rocks won’t. Plus rocks are impervious to the natural elements; they can withstand water, wind, cold temperatures (including snow and ice), and our hot and humid summers. 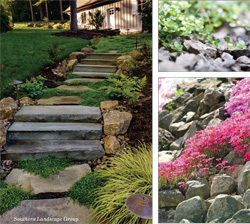 Mother Nature doesn’t limit herself to just one size rock, and if homeowners are committed to landscaping with natural materials, it’s a good idea to learn some of the basic properties offered by different options. Smaller rocks are often grouped together under the heading “gravel.” These rocks can be functional in terms of helping drain areas, or just visually appealing, adding another layer of texture or color. Usually they are installed to provide a combination of the two. A few examples include: decomposed and/or crushed granite, which can range from almost silt-like to small, uneven pieces, less than half an inch in diameter; pea gravel, which is a small, rounded rock usually less than an inch wide; and river rock, which is usually about an inch wide or bigger, and sometimes used to create dry creek beds. All come in a variety of colors. Generally, medium-sized rocks (and there is a really big range here) are utilitarian. One of the most common types at the lake is rip-rap, which is a type of stone used in ditchlines and shorelines to stabilize the soil. 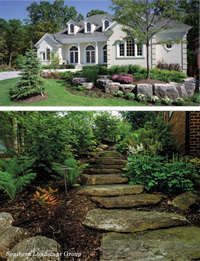 Medium-sized rocks can also be used to create hardscapes: think steps, fire pits, or seating areas. They can be cut to be uniform in shape and size, or left natural, depending on the project and the aesthetic. Large rocks are often called boulders. Technically, they can as small as ten inches in diameter, but for conversational purposes they are much bigger, ranging from 2,500 to 6,000 pounds (one to three tons). They can be rounded or flat in shape, and landscapers say each form lends itself to particular projects. Large rocks are a great w ay to add a more decorative element to drainage and erosion control while pleasing the eye. Boulders are often used as an aesthetic centerpiece—to give a “wow” factor to a particular view—or for what landscapers call architectural features, which means that in addition to looking nice, the boulder is performing a function, like acting as a retaining wall. This helps with soil retention and erosion control, both especially important for the sloped land so common at the lake. For companion plantings, Maslow suggests sedums (a succulent, droughttolerant plant with many varieties), carex (grass-like, colorful foliage that is often brightly hued or variegated), creeping phlox (blooms in spring, trails nicely), scotch moss (particularly in the shade), astilbe (tall, fluffy plumes that tower above frilly, fern-like foliage in the shade garden), mazus (mat-like ground cover with blooms from spring through summer), and ajuga (durable ground-hugging perennial, also known as bugleweed, in a variety of colors). Maslow, who has been using rocks and boulders in his designs for years, says one key to incorporating elements into a cohesive landscape is to not make anything too perfect—he tries to replicate what would most likely be seen in nature. A critical component, he says, is choosing the right sized boulders: if they are too big, they can dwarf other landscaping elements; if they are too small, they can get lost. Also on the rise: the use of rocks to create walkways—with either very structured cut stone and uniform shape (think slate or flagstone) set in mortar, or more natural looking stone with rough edges and variable shapes and sizes. Because their surface texture is lightly roughened, the rocks offer good, safe traction, even when wet. To add even more texture and visual impact, designers suggest using a different type of rock to edge the walkway, almost like the outlines of a picture in a coloring book. Sometimes the grade of the land will be the determining factor for which type of rock will be the best; other times, it will depend on which rocks resonate with property owners. The same holds true for both the width of the walkway (people can move more quickly and easier on a wider path), and whether it is straight or meandering. As more and more homeowners are adding outdoor living areas, stone is being incorporated into those spaces as well. It’s ideal for seating walls and fire pits because of its durability. Again, the choice of what type of rock to use will be determined by the shape of the property, the surrounding elements, and homeowner preference. Natural beauty is undeniable It should come as no surprise that homeowners at the lake are looking to nature for inspiration when sprucing up their landscapes. Creating an eye-catching aesthetic, whether formal or bucolic, is possible with the use of carefully placed rock accents that play with scale, color and texture. Using a professional landscaper can help ensure that the positive characteristics of the property are highlighted (think vistas) and any problematic issues, such as erosion, are minimized.